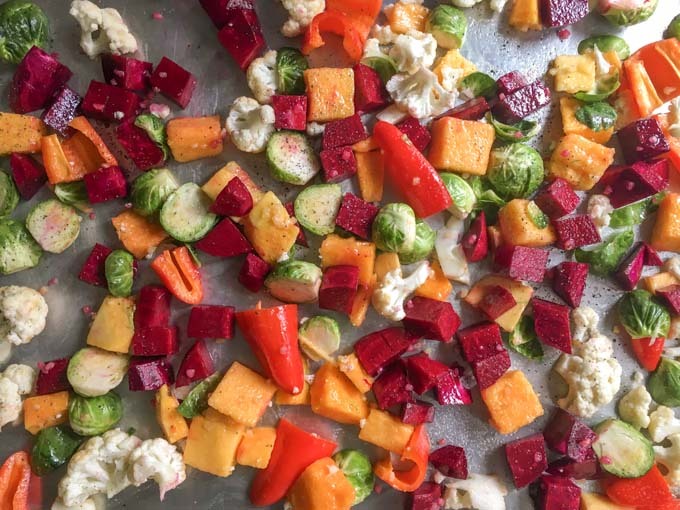 Just in time for the holiday season, this colorful and flavorful roasted vegetable & goat cheese salad is perfect for a crowd. Roasted winter vegetables are tossed in a light dressing and topped with tangy goat cheese. This week at Sunday Supper we are celebrating holiday salads. I often bring salads to my family’s holiday parties because I love salads so much. That’s why I was excited for this week’s theme. Roasted vegetables are a staple at this time of year and of course I seem to be adding goat cheese and pine nuts to everything. So that is what I came up with today, a roasted vegetable & goat cheese salad. The sweetness of roasted winter vegetables, the tang of the creamy goat cheese and a hearty kale for the greens. 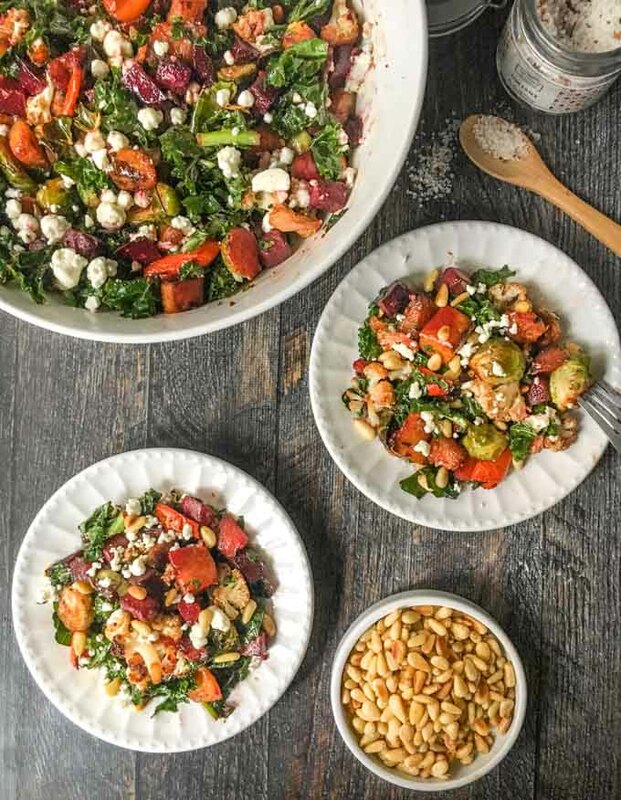 All of these goodies tossed in a light honey dressing and topped with my favorite … pine nuts! Last year at this time I made a similar dish. It was a pomegranate quinoa pilaf. It was very colorful and served warm but you could also eat it as a salad the next day. This salad is good with the warm vegetables but tasted just as good the next day chilled from the refrigerator. I love dishes like this that you can get double duty from. The winter vegetables I chose were beets, butternut squash, peppers, cauliflower and brussels sprouts. I let them roast in the oven until soft and caramelized. There is dish number one. You can serve just the vegetables for dinner one night and make this salad the next day with the leftovers. When I make this, I like to whisk up the dressing while the vegetables are roasting and dress the kale with half of it. This way the kale will soften a bit. Then when the vegetables come out of the oven I toss them with kale and the rest of the dressing. The dressing is simply oil, balsamic vinegar and just a bit of honey (not the candy, haha). I like white balsamic vinegar like this one for light dressings such as this. One note, let the vegetables cool down a bit before mixing in the goat cheese. You don’t want to melt the cheese. This salad is best served warm or room temperature but it’s still very good the next day refrigerated. I hope you like this colorful and festive holiday salad. 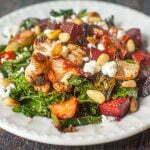 Please scroll down and check out my friend’s holiday salad recipes. That’s were I’m off to now. Can’t wait to see what they have come up with! Just in time for the holiday season, this colorful and flavorful roasted vegetable & goat cheese salad is perfect for a crowd. 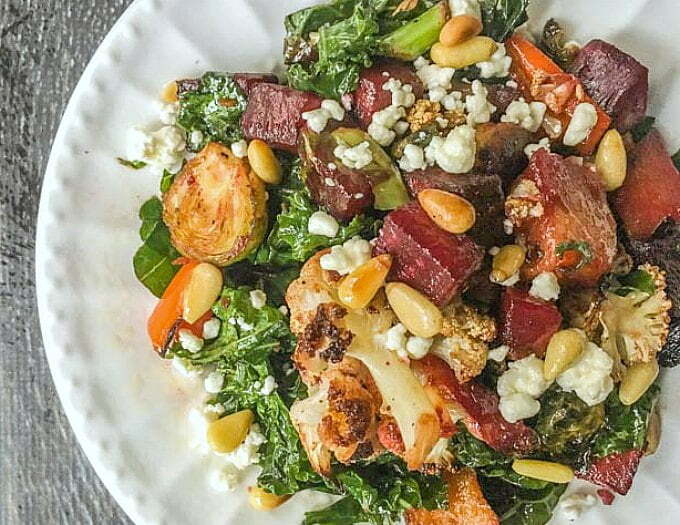 Roasted winter vegetables are tossed in a light honeyed dressing and topped with tangy goat cheese. Toss all the vegetables in the olive oil and garlic. Spray 2 cookie sheets and pour the veggies on and spread out so they cook evenly. Sprinkle salt and pepper over them. In the meantime make your dressing by whisking the vinegar, oil and honey. Toss the kale with half of the dressing and let sit until veggies are cooked. Add the veggies to the salad and toss with remaining dressing. Top with goat cheese and pine nuts. Denise, your salads and soups are superb! This was especially tasty. I love everything about this salad, Denise! 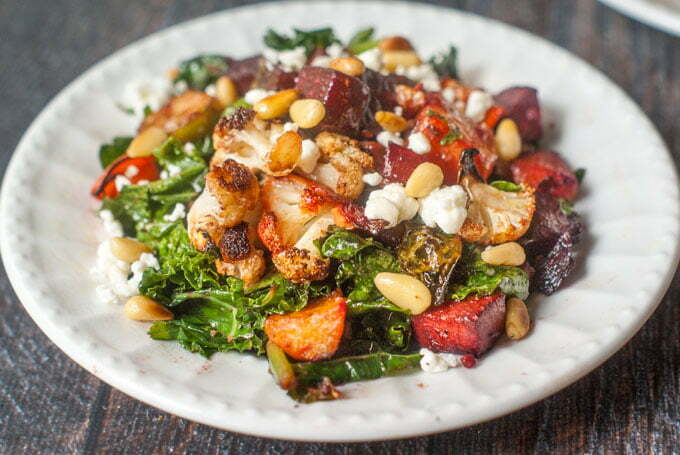 All my favorite roasted veggies, and then those pine nuts and goat cheese! Wow! What a beauty, Denise! I’d have to omit the beets for my husband but I love the whole thing! Such beautiful colors! I love roasted vegetables, and goat cheese, so this is right up my alley! Dishes that can serve as two meals are perfect for this busy time of year! Yes Cindy, they are my favorites!